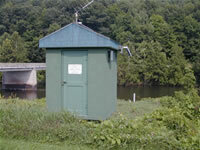 LOCATION.--Lat 41`54'30", long 77`07'47", Tioga County, Hydrologic Unit 02050104, on left bank 130 ft upstream from highway bridge on Township Route 667 at Tioga, 0.8 mi upstream from Crooked Creek, and 0.9 mi downstream from Tioga Dam. GAGE.--Water-stage recorder and crest-stage gage. Datum of gage is 1,021.07 ft above National Geodetic Vertical Datum of 1929. Prior to Sept. 9, 1953, at site 20 ft upstream at datum 2.11 ft higher. Sept. 9, 1953 to Aug. 10, 1954, at site 130 ft downstream at present datum. Satellite telemetry at station. REMARKS.--Discharges include flow diverted from Crooked Creek into Tioga River since Oct. 1, 1977. Flow regulated since November 1979 by Tioga Dam (station 01517900).